Pune is the second biggest city in the Indian province of Maharashtra, after Mumbai. 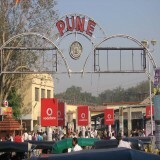 It is the ninth most crowded city in the nation with an expected populace of 3.13 million.Along with its Industrial twin Pimpri Chinchwad and the three cantonment towns of Pune, Khadki and Dehu Road, Pune frames the urban center of the eponymous Pune Metropolitan Region.According to the 2011 enumeration, the urban territory has a joined populace of 5.05 million while the number of inhabitants in the metropolitan locale is assessed at 7.27 million.Situated 560 meters above ocean level on the Deccan level on the correct bank of the Mutha river,Pune is likewise the authoritative central station of its namesake area. In the eighteenth century, the city was the seat of the Peshwas, the head administrators of the Maratha Empire as was a standout amongst the most vital political focuses on the Indian subcontinent.Pune is positioned the No. 1 city in India in 'simplicity of living' positioning list. The city is viewed as the social capital of Maharashtra.It is otherwise called the "Oxford of the East" because of the nearness of a few surely understood instructive institutions.The city has developed as a noteworthy instructive center point in ongoing decades, with almost 50% of the aggregate worldwide understudies in the nation examining in Pune.Research establishments of data innovation, instruction, the executives and preparing pull in understudies and experts from India and abroad. A few schools in Pune have understudy trade programs with universities in Europe.Pune is additionally a vital community for common administrations preparing.